Summer has started and so has Bega Valley Shire Council’s work in the 2016-17 Beachwatch Partnership Program. Council works with the Office of Environment and Heritage from December to February to inform the community about water quality and the best places to swim. 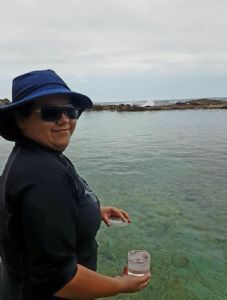 BVSC Environmental Health Cadet, Amanda McKenna, said samples are collected weekly from 14 of the Shire’s popular swimming areas which are monitored for Enterococci and then analysed to produce the weekly ratings. “The rating categories range from good, fair, poor and bad. The State of the Beaches 2015-2016 report showed that all of the sampled beaches were graded as ‘good’ which has been the result achieved for the last four summers. “Across Bega Valley our monitored sites include ocean beaches, estuarine beaches, lake/lagoon swimming sites and ocean baths. “Some general warnings for safe swimming this summer are to avoid swimming during and at least one day after heavy rain at ocean beaches due to the possibility of pollution from stormwater. “Avoid swimming near stormwater drains or sewage outfalls and also avoid swimming if you see signs of pollution such as discoloured water, oil or scum on the water, and litter or other debris floating in the water or on the tide line,” she said. You can access results for the 127 locations across NSW through the Beachwatch App. To view the Bega Valley Shire’s latest Beachwatch results, visit Council’s website and go to Environment and Health > Health and Safety > Beachwatch. Photograph: BVSC Environmental Health Cadet, Amanda McKenna, testing the water quality at Blue Pool in Bermagui.